The new Spectrum Analyzer R&S FS315, includes a tracking generator and thus expands the field of application to scalar transmission and reflection measurements. 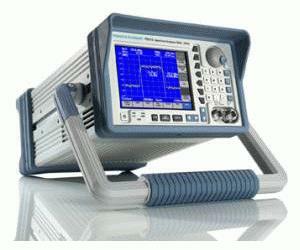 A special feature of the tracking generator is the user-selectable frequency offset in the range from 0 Hz to 3 GHz, which makes it possible to perform measurements on frequency-converting DUTs such as a frequency mixer. For simple applications, the tracking generator can also be used as a CW signal source with a permanently set frequency. In addition, the R&S FS315 can determine electric field strength taking into account the antenna factors. Altogether up to ten transducer lists can be generated using the provided software. These lists can be combined by means of transducer sets into a cumulative correction factor for a complete measurement system. Such a system may include, for example, an antenna, various cables and additional amplifiers.